It’s October 1st, the humidity is gone and it’s Sunday – time to go up to the attic which hasn’t been cleaned since we moved in during the summer. This 1870 house was owned previously by one family for nearly all of its existence, and there are piles of photographs, tarnished silver-plated spoons and forks, and other detritus that people can’t bear to throw away scattered across the attic floor. It is always the sentimental Christmas greetings, graduation cards, death notices clipped out of brown newspapers that are hard to put in the trash. 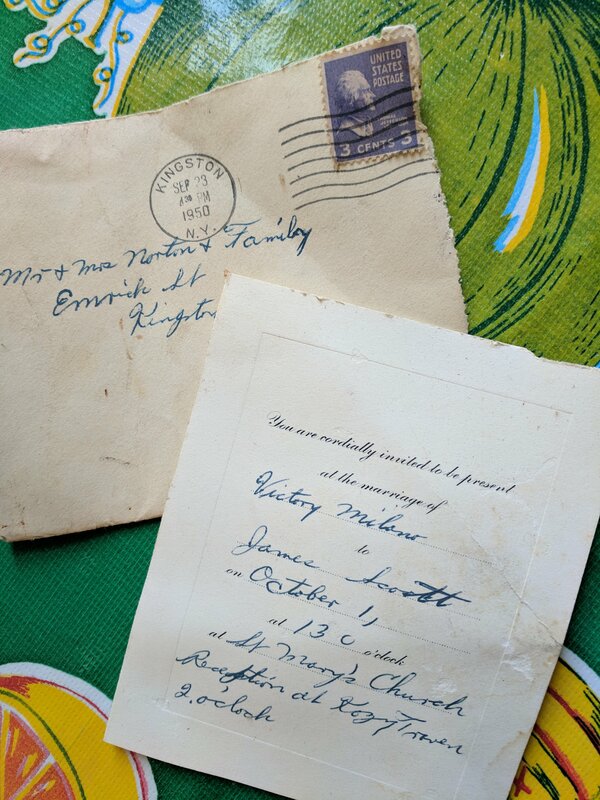 But what I found today was weirdly coincidental, a handwritten wedding invitation for Victory Milano and James Scott for October 1, 1950. There are only a few facts I can relate about this invitation – it was mailed for a mere three cents one week before the wedding. Kingston was so small at that time that the sender only needed to list the addressee, street, and city for it to arrive. The church where the wedding was held was founded in 1845 and attended by a strong Irish immigrant population and continues to operate today. Initially, I was puzzled over the name Victory, but that is a Latin derivative for the woman’s name, Laura, stemming from the laurel branches placed on the victor’s heads during Roman times. I wondered if Victory went by Laura or Victoria as she lived her life. The place where they planned the reception did make me pause – the Kozy Tavern operated one block from this house for decades. After closing, the place is now operating as The Beverly, a place where I frequently hold artist meetings. The current owner kept the old wooden bar, painted murals above and tin ceilings when he reopened. Now I am imagining how Victory and James came here after their wedding on October 1, 1950, and were congratulated by family and friends. What an intriguing find, and wonderful writup, as always. Way cool! What an interesting coincidence to come across it 67 years later. I imagine the Beverly didn’t look much different then than it will on Thursday night. See you then.